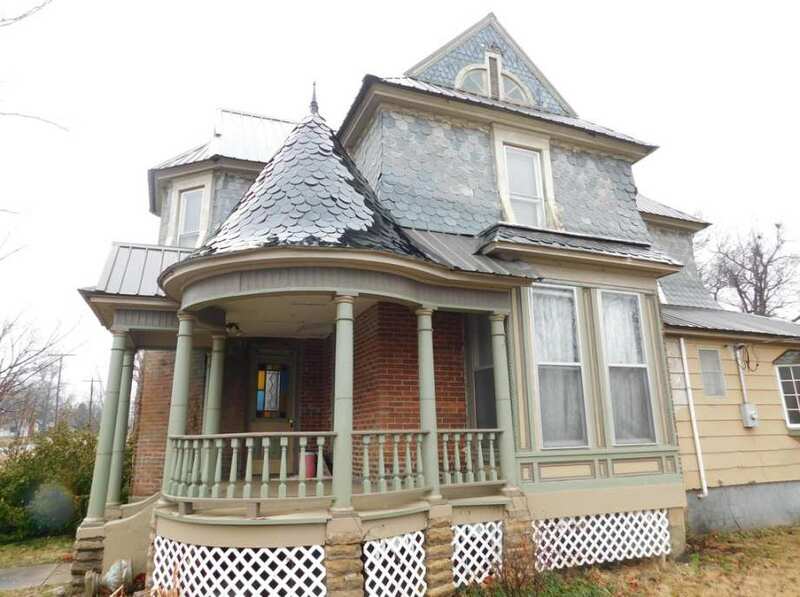 Located on a corner lot, this Victorian house has all the original charm and modern updates. 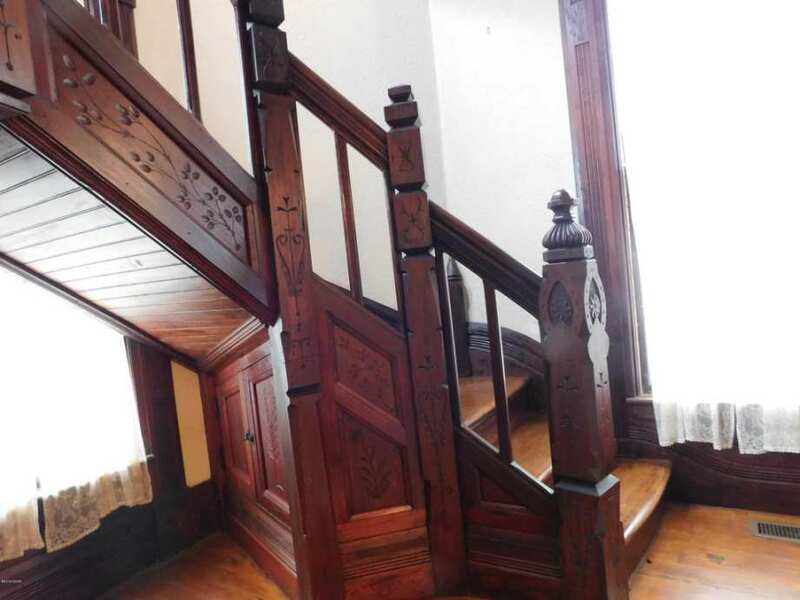 From its original hand carved stair rail, to the tile walk-in shower - you will enjoy this house. 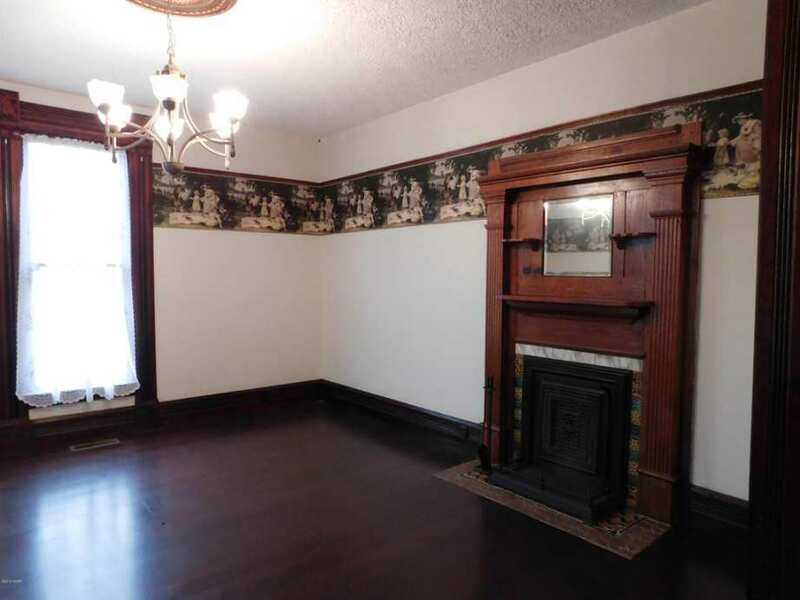 Main floor features a sitting room and living room, both with ornamental fireplaces with beautiful floor to ceiling pocket doors for privacy. 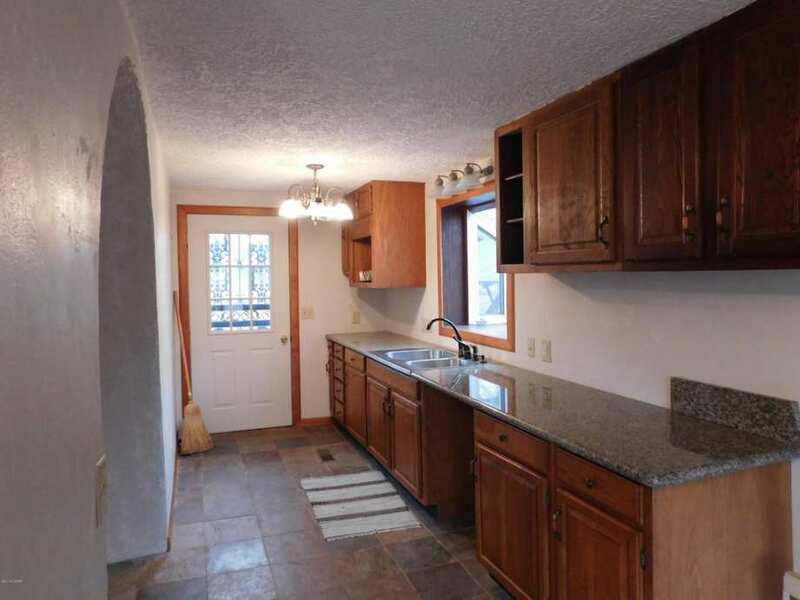 The kitchen is a traditional small galley kitchen, with a larger dining area with open archways and built-in hutch. Want a little more intimate nook to enjoy your breakfast and coffee while you watch the birds through the wall of windows? 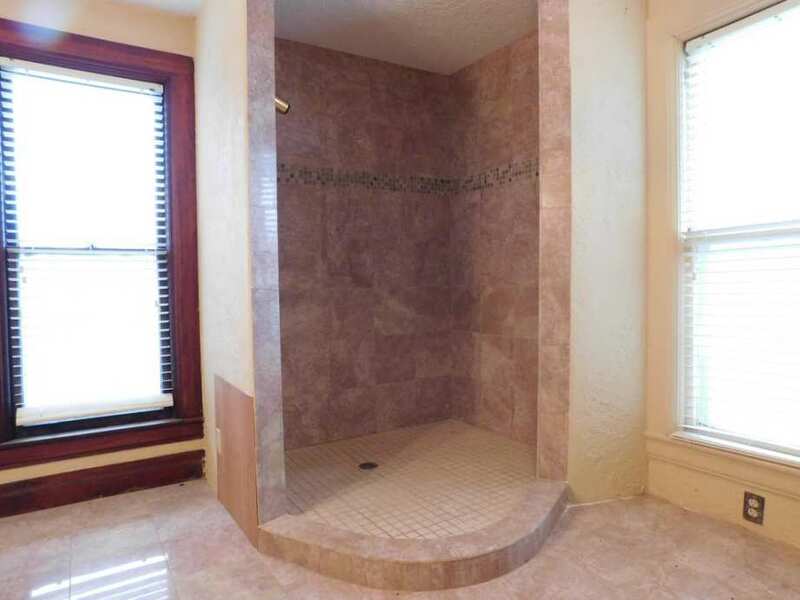 This home has that too! 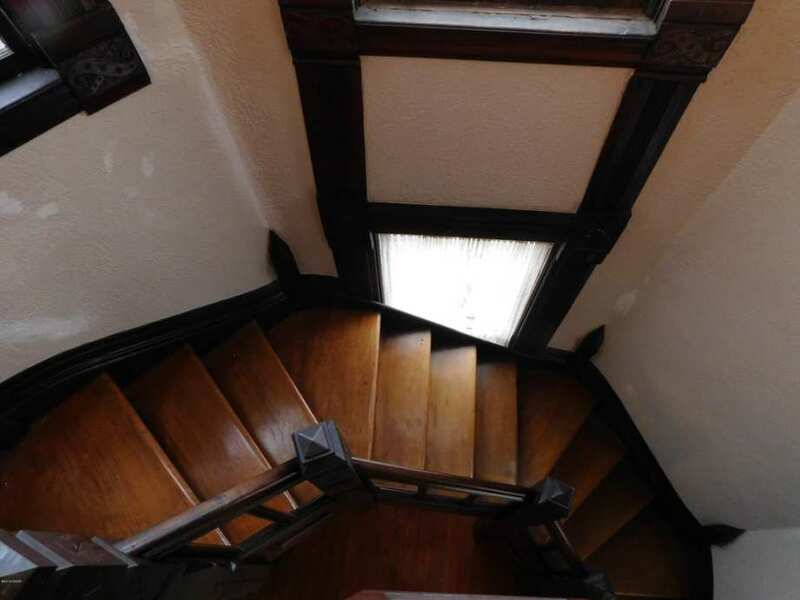 Going upstairs, you have your choice of taking the simple maids staircase in the back or the beautifully hand carved heavy wood staircase in the front. After I make these comments, people might think I’ve been to the far corners of the earth but our one and only visit to Chetopa, KS was back in the winter of 2000 and was a fluke. We had planned a New Year’s eve road trip and our first visit to St. Joseph, MO (not a good idea in the dead of winter in hindsight) so rather than follow the safer Interstates a decision was made to follow the old U.S. Hwy. 69 from Dallas-Ft. Worth to Kansas City and then on to St. Joe. I had a camera at ready because the reduced vegetation in winters often provides the best photo opportunities for old house picture taking. Somehow, around the tiny historic town of Baxter Springs, KS we made a wrong turn and ended up in Chetopa and continued going west to Coffeyville before realizing the error of our ways and turning back. I took a photo of a blocky Italianate style home turned funeral parlor in Chetopa as well as the town’s City Hall which had some glorious arched rainbow colored stained glass windows in the long brick building. Our travel schedule was tight and with abundant snow on the ground (patchy ice on the roads) and sub-freezing temps it necessitated us reaching Ft. Scott, KS by nightfall. So, in summary, I didn’t see this particular house. Southeast Kansas and on into western Missouri has a number of faded but picturesque towns like Coffeyville, Parsons, KS, and Neosho and Carthage MO; the latter town having an abundance of 19th century architecture. As for this unusual house I think it might actual date from the earlier era (1870’s?) and was later “Queen Anned” with the porch pavilion and added to the mansard roof top gables but at its core it was originally a simple brick Second Empire. Some of the woodwork is highly individualistic such as the “minstrel gallery” with the carved panels above the staircase (defined by Wikipedia as: A minstrels’ gallery is a form of balcony, often inside the great hall of a castle or manor house, and used to allow musicians to perform, sometimes discreetly hidden from the guests below) The pocket doors with many raised panels are an unusual feature as well. 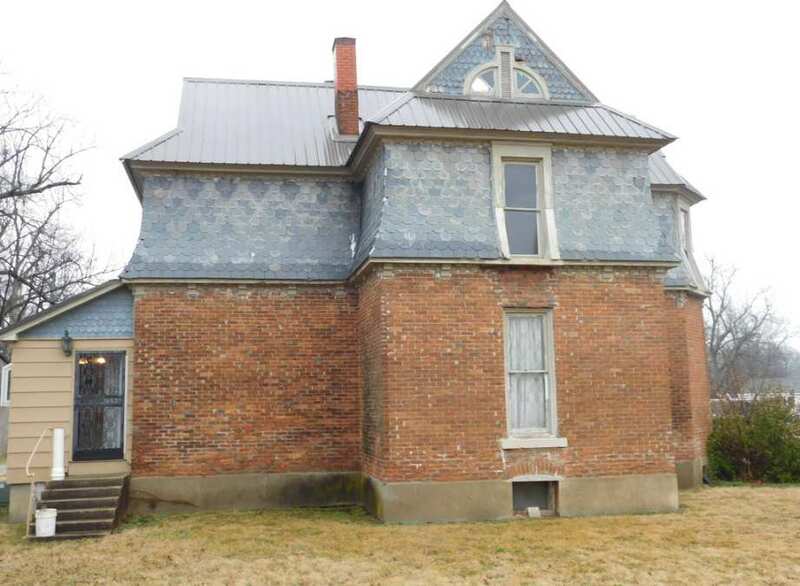 While this region may have been and still has a lonely feeling of remoteness, architecturally it seems to have been very independent in the late 19th century-nearby Carthage, MO has some very distinctive Victorian era homes and buildings. 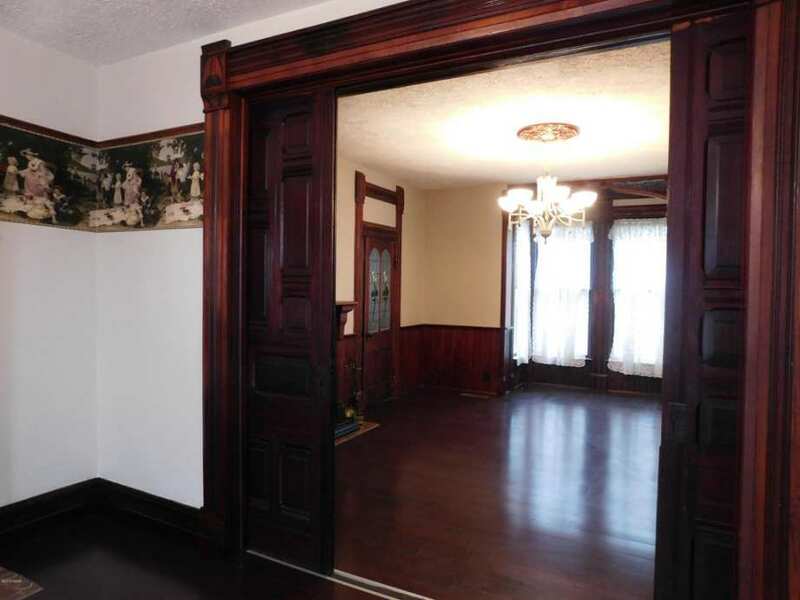 I think some of the carved panels inside this one may reflect the carving talents of a former owner because they depart from millwork catalog items. 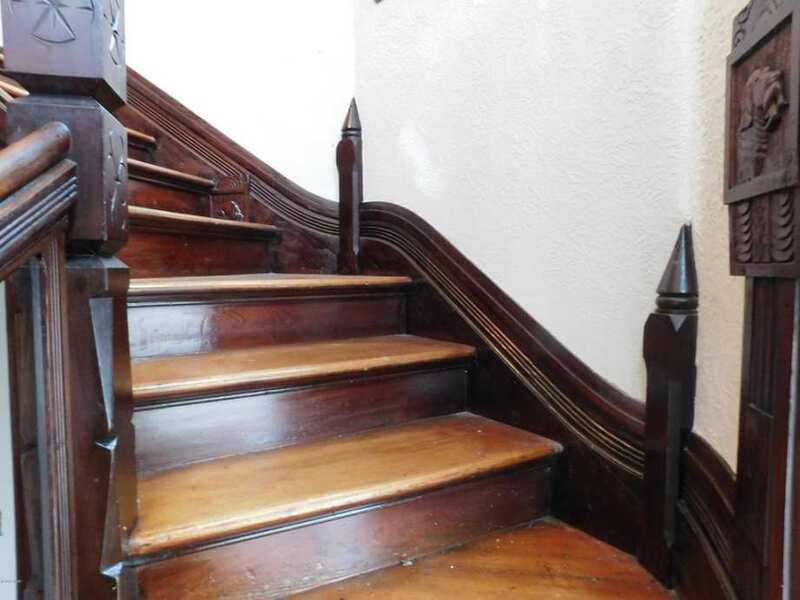 Even the newel post seems hand carved rather than a stock catalog item. 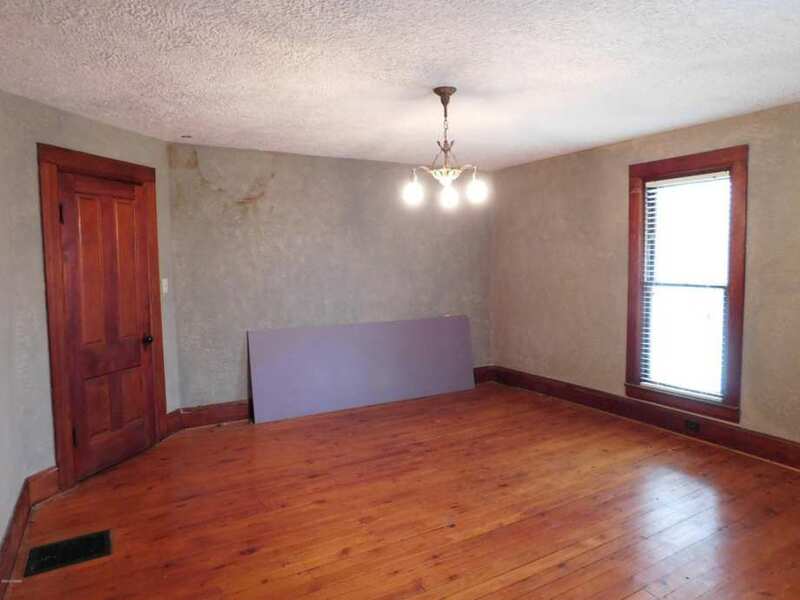 If one is ok living on the open plains of southeastern Kansas in a small town that has seen better days, at this low price you’d have an interesting vintage home. I live in Chetopa and I know this house quite well. 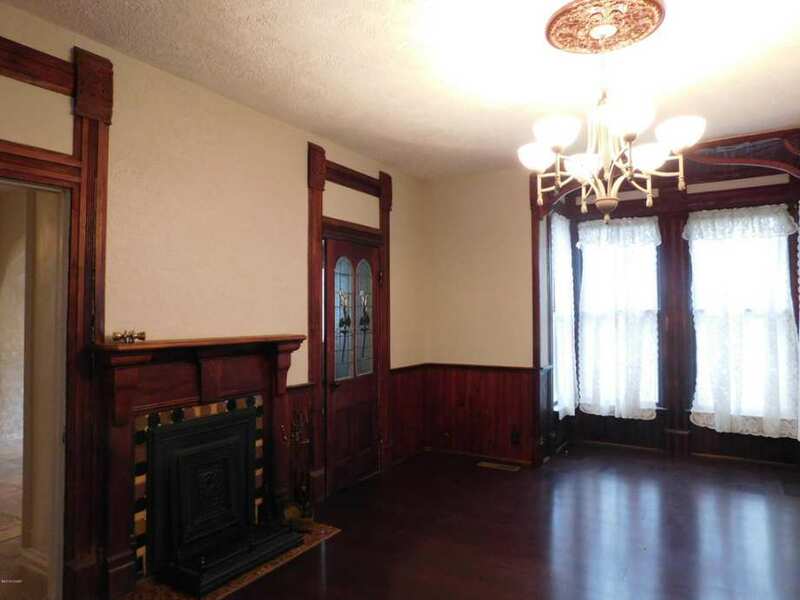 Have been inside and had thought about buying the place when it was even less that what it is listed for now. 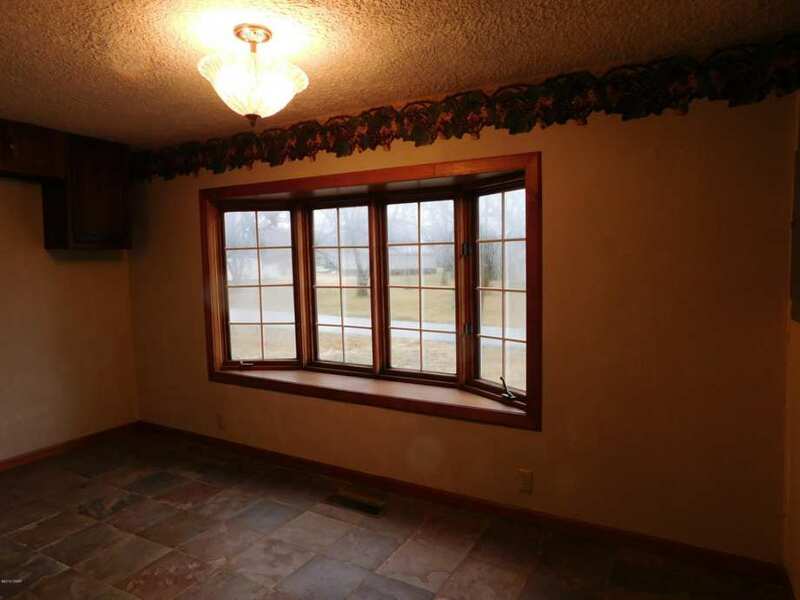 The woman who bought the place bought it to flip but was never able to. It’s been vacant for probably 20 years. My ex husband put the metal roof on the place for her. On the staircase it has carvings of cocker spaniels by the hand railing. 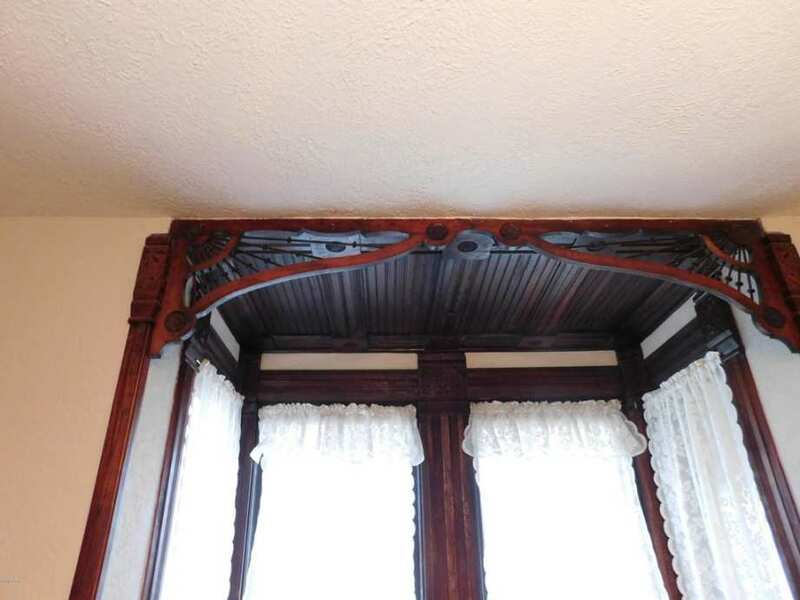 The wood work is or was in very nice condition.The main reason we didn’t buy it was because it has absolutely NO land with it. 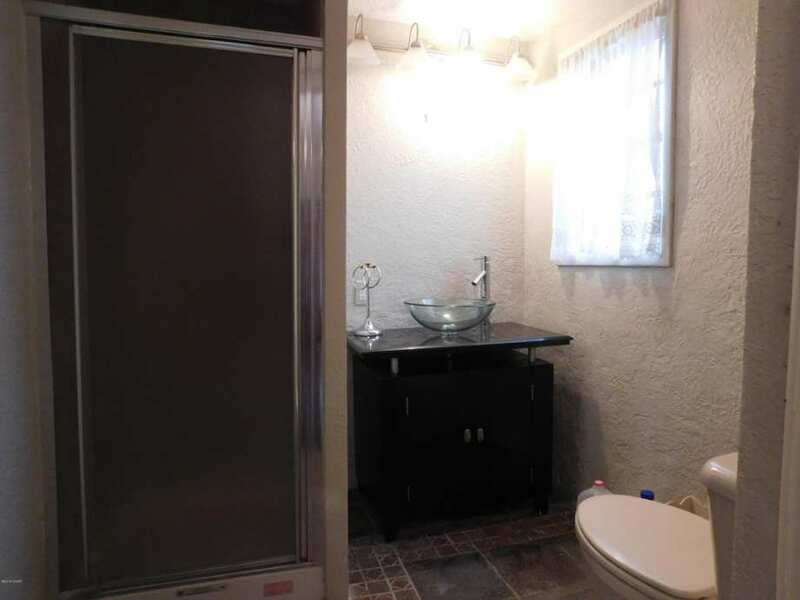 It sits on a small corner lot and pretty well takes up the entire thing.If it would have had more ground to it,I’m sure it would have sold long ago. 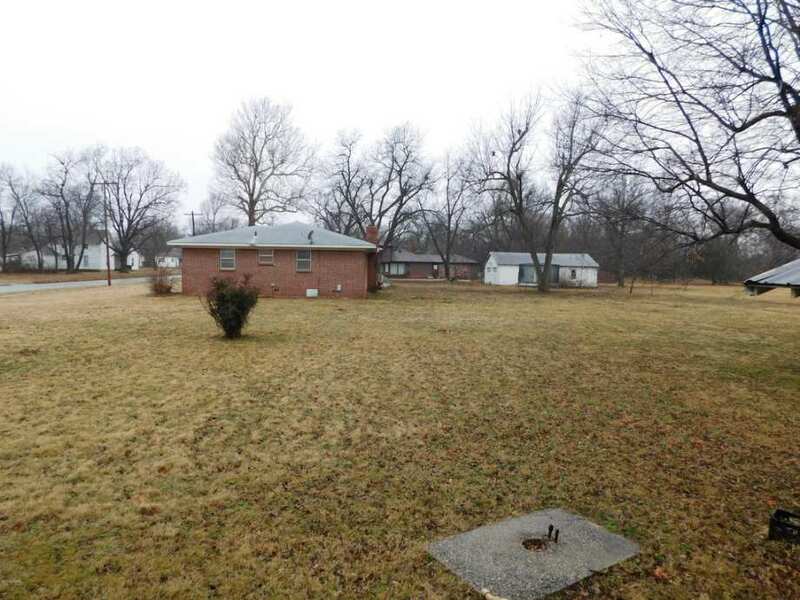 The posting states that the lot is almost an acre. That’s not a small lot. This is the “comments above may be older”, her comment was in 2016 when it was showing on a .31 lot. You’re not nuts Shiflet. I was actually thinking when I saw this that it looks like a house that had been “modernized” with the new style of Queen Anne as well. Maybe in the 1870 the update happened so 1860s could be a good guess. 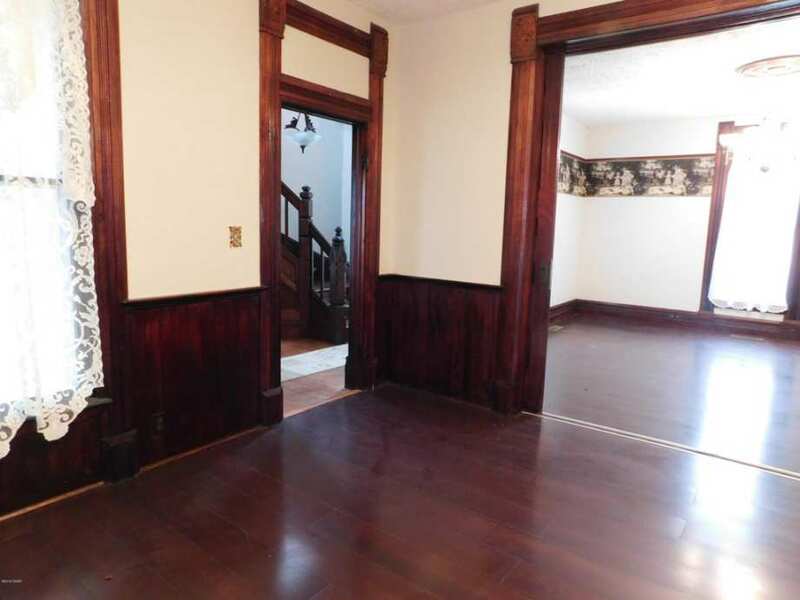 The woodwork in this house is wonderful. I’d buy this little house. 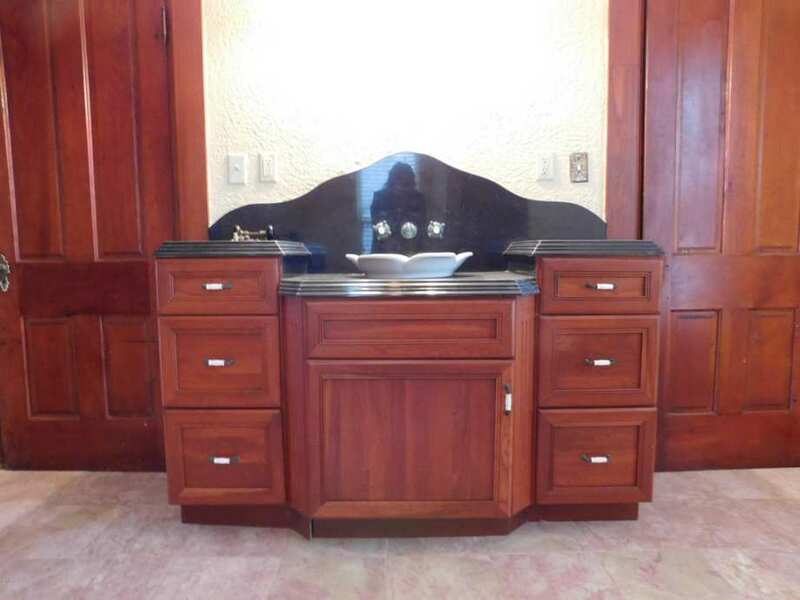 That kitchen and bathroom though, what is that! 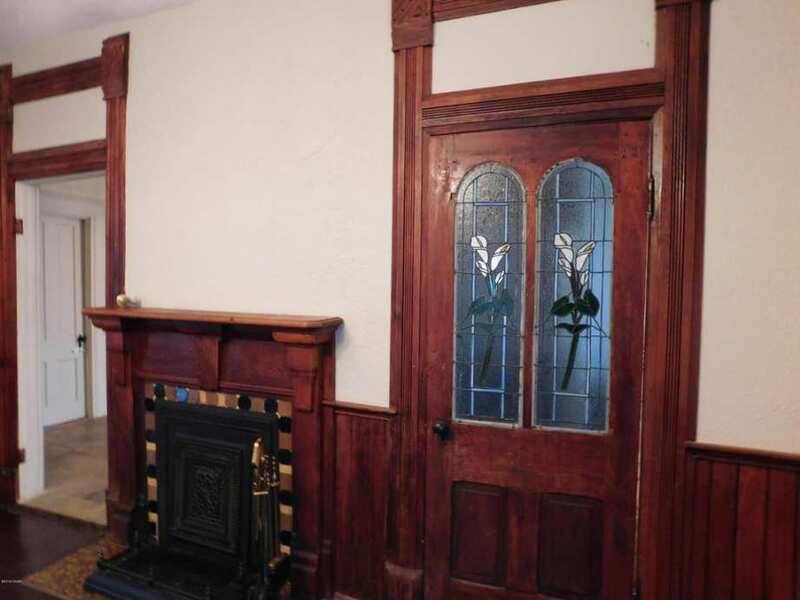 I ran into almost the same woodwork as this home in a house I’m currently restoring. 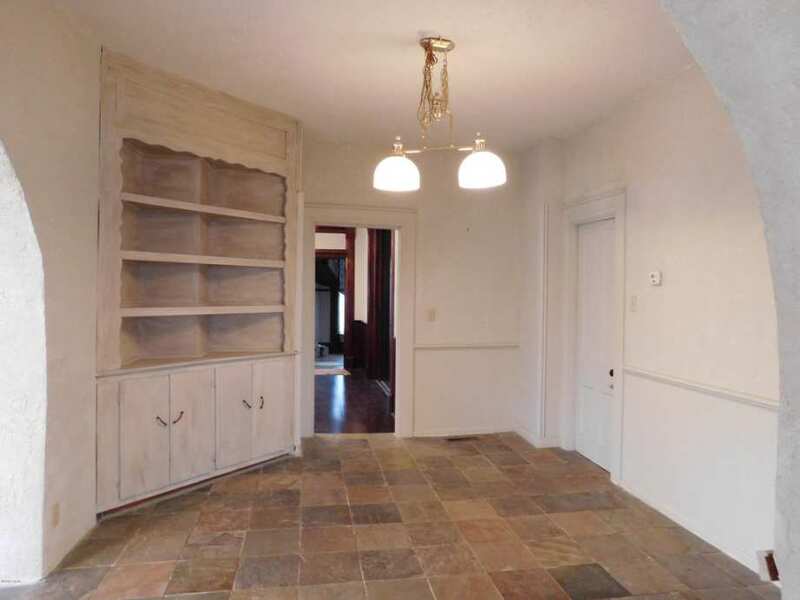 Since it is a well documented house, I was able to find out some things about his “Non catalog” millwork. Our project’s woodwork was purchased as “blanks” with the hand carving made to order. These “blanks” were carved with all manner of plants and flowers found in Iowa, as was the desire of it’s original owner. The original “Blank” corner blocks, newels, etc. found in our project came from a company in Chicago, but the name escapes me. That’s wonderful information. How I’d love to see the house you’re working on. 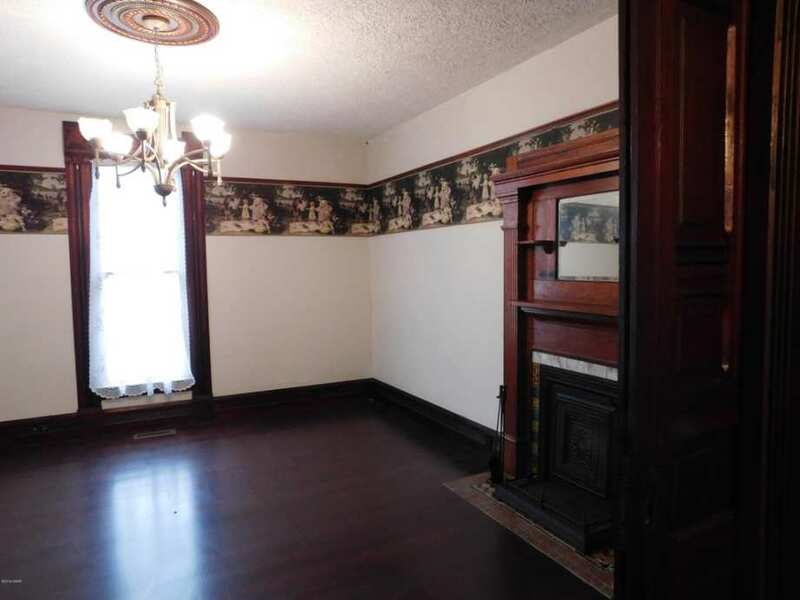 We’re the transoms plasterboarded or is that just a way of putting on molding? Anne modifications do give it a bit of quirkiness which is undeniably appealing. Usually homes of this style are so huge, but this one is petite and super cute! I hope a loving new owner finds it and restores it back to original. I too love this little home for it’s size!! We are soon to be retirees and as much as I love some of the bigger homes, we won’t be able to do, or afford to have done, the upkeep required. 🙁 So, if little gem was closer to someplace we are considering for retirement, we’d be there making this ours before anybody else can grab it!!! one of the state’s biggest drawbacks. Thanks Eric, I appreciate the input. Affordability is certainly something we need to consider and with kids spread across the country, central location is also pretty important. I think we’ll do some investigation. Thanks, John for some more living thoughts on the area. Again, thanks John. Tornados are a scary thing to me coming from Michigan…we just don’t see them as much. 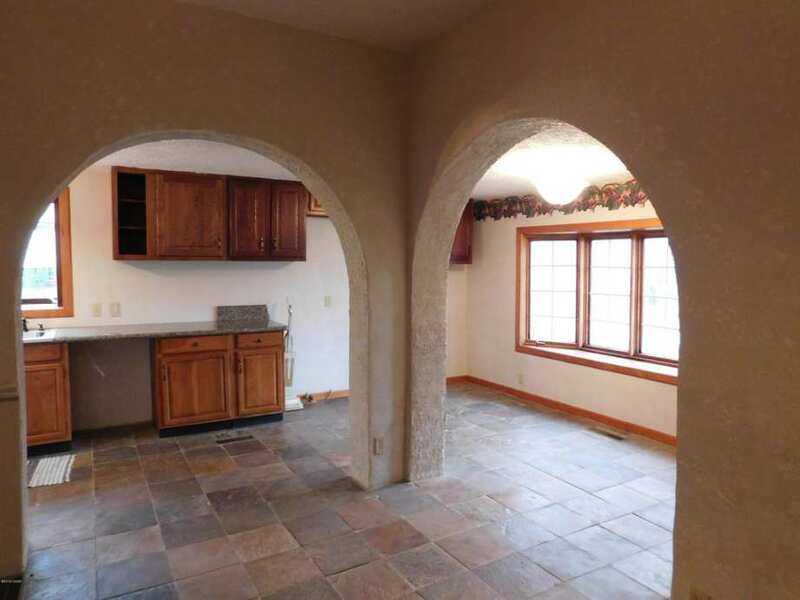 But I did learn from the realtor that there is an unfinished basement which soothes my nerves somewhat. And you are definitely right…like I told Ryan, the fact that it’s the oldest house in town (and apparently many older homes) says something. Can you guys give me an idea of the terrain of the area…we love mountains (which of course there aren’t any), but is it still somewhat rollling on the east side of the state? I remember liking eastern Iowa because of the rolling hills. Right by the Flint Hills… wide open plains, rolling hills, tall grasses, rock outcroppings…. I always imagine wagon trains heading west and the movie ‘Dances With Wolves.’ Every one I know has a basement, most towns now have warning sirens, and tornadoes generally have a small base and are short lived. When I think of coastal hurricanes, western earthquakes,northern sub-zero blizzards, southern heat, lack of water rock and sand yards…. I’ll take the mid-west every time. As for tornadoes, again, the local residents are alert and cautious especially during the prime Spring season. Tornadoes are often highly destructive but also unless they are the rare wide wedge shaped monsters, (as hit Joplin, MO) they are fairly limited in the path/width of their damage. People in Missouri, Kansas, Arkansas, and Texas, have to live with the Tornado threat but you can live in these areas your entire life and never be directly impacted by one. For what its worth, old houses tend to hold up well in a tornado but no house will withstand a direct hit from a big F-3 or greater tornado. Perhaps because of global warming or climate change, even areas where tornadoes have historically been rare have seen more of them in recent years. (that includes Michigan and the upper Midwest) People on the West Coast have to watch out for earthquakes; people along the Gulf Coast and along the Eastern Seaboard (remember Sandy) have to watch out for tropical storms and hurricanes; people along major rivers have to look out for flooding; in short, very few places are risk free from the threats of nature but common sense and adequate precautions can minimize the risks. I tried to buy something in Carthage last summer because I needed a better school for my teenager, but just didn’t find anything I wanted within my budget. Carthage is anything but a fading town. Industry is developing in that area because of the straight shot highway to the Gulf area. Lots of Arts programs. Joplin is getting a spin-off of the Med School. The public schools in Carthage have a good STEM focus. Having lived in several areas which have been hit by large tornados–that’s just going to be luck of the draw. I have lived in California my whole life… a long one. Earthquakes are rare compared to the every year bout of tornadoes and hurricanes the rest of the country sees. I will say though, I could sell what i am living in now, buy something like this, which is better that what I am in now and have a hefty retirement fund left over. It almost churns my stomach to see the prices others are able to buy homes for. The prices out here are insane as are the taxes. But, it is a family farm. What to do. I would love one of these beauties. That staircase is amazing! There’s even a little spot for Harry Potter! Love so much about this. Except the whole Kansas part. What’s wrong with Kansas? Lived here all my life and it has it’s pluses and minuses like every state in the US. I would like to chime in about Kansas. I grew up in Minnesota and when we moved to Missouri, my mother was terrified of living in tornado central. It’s not that bad in reality. Having a basement is recommended. And It does get worse the closer you are to Oklahoma though… which sadly, this is very close. Still, I don’t think it’s as bad as anyone imagines. But anyway, back to Kansas. If you think Kansas is flat and boring, you’re only somewhat right. Look up the Flint Hills. They are gorgeous, rolling hills in Kansas that make my heart sing when I drive through them. And such an unexpected, lovely thing about Kansas. It’s not the tornadoes that bother me. It’s the lack of employment in my field. I made a new friend because she moved away from Kansas in an attempt to get work. As it turns out, Ohio isn’t much better but at least she got something in Chicago. Btw: that field is entomology. Hence my screen name. The house is intriguing, but also are all the wonderful comments and information on the home and the area. Thank you all so much for taking the time to share your stories and impressions. I grew up in Kansas. My parents moved there when I was a year old so my father could hopefully find work at the new (in 1970) Iowa Beef Processing plant in Emporia, about 2.5 hours NW of Chetopa. Lived in Emporia until college, then lived in Manhattan, KS for awhile. Eventually ended up in Pittsburg, which is in the far SE corner of the state, very close to Chetopa. I moved away from Kansas in 2005. Pittsburg is a nice, small-ish college town, with incredible hometown restaurants and decent shopping. I loved it there. Having spent most of my life in KS, I have had some experiences with tornadoes. The times that I actually encountered a visible one…can be counted on one hand. Most of time, there are warnings and sirens due to funnel clouds spotted that never reach the ground, or as a precaution if there is a storm in the area. Basements and storm shelters are common. I rode out the 1974 Emporia tornado (was very large, F4 or 5 I think – it can be Googled) in the basement of our home without a scratch. The tornado passed a block west of us. The weather just becomes a way of life there. There is nothing like a beautiful spring day spent in the Flint Hills, with the prairie and the bluest sky you’ll ever see in your life. LOL, Cora, I would move back in a heartbeat if it wasn’t for my husband’s job. I keep clicking my heels together but nothing happens. I’d take a tornado over another long dreary Michigan winter. Me too, Brandy! I live in TN now, which is beautiful in its own right, but…there’s no place like home. As an adult, I enjoyed sitting on the front porch, watching a summer thunderstorm roll in on the plains. I would sit out there and watch mother nature’s fury… while my husband took our two cats with him to the storm shelter in our back yard! Lol. There is really beauty everywhere. I moved from Topeka to Anchorage, AK in 91 and it took me a long time to get use to not having the open sky. I don’t even think it is flat until getting west of Manhattan. We lived in a Horne’s store on the Turnpike at Paxico when I was in jr. high. People forget that most of Colorado looks just like western KS. I was born and raised in Kansas, too; went to college at KU then graduated from Emporia. Lived in Kansas City for about a year for an internship and absolutely loved it! Best place in the world! 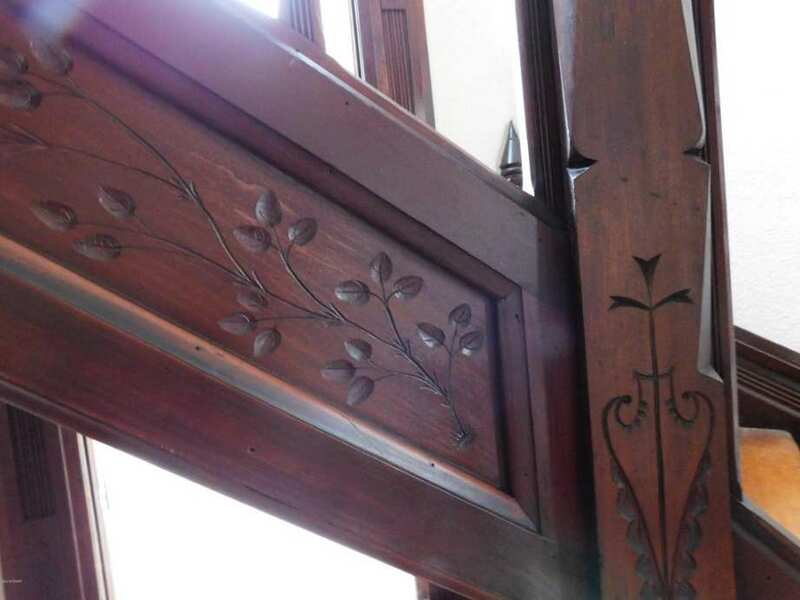 I love the history of the owners of this house, the intricate woodwork that the owner carved (what talent! ), even the style and it’s big enough for a small garden, which is enough for me to take care of. For those not familiar with Kansans, those folk are salt of the earth kind of stock. My Mom was in four tornadoes growing up, they always seemed to bypass her family home, but she & the neighbors were right there to help those who weren’t so lucky; it’s just like that there. 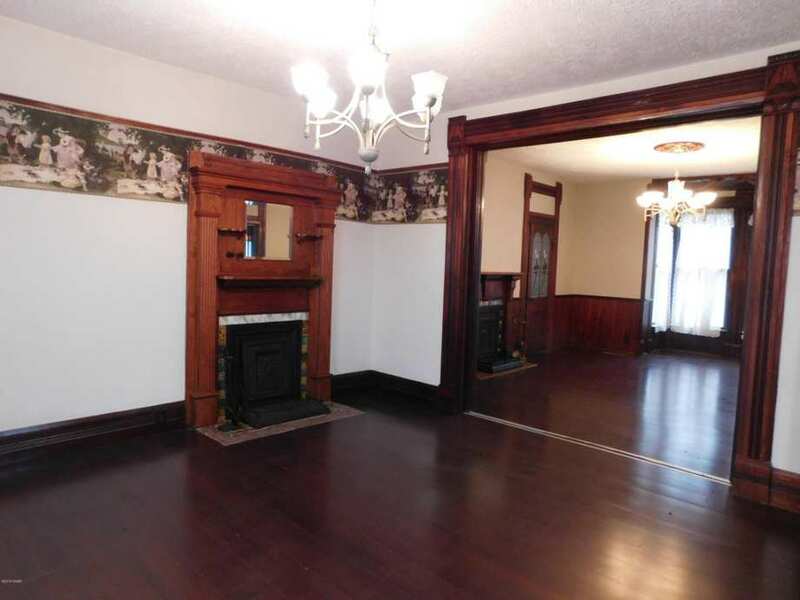 This home has good bones–a lot to work with here. I have lived in central Oklahoma for 30 year now. I have to second Cora’s point as tornadoes are a way of life in these parts. We have had close calls but never directly affected. Shelters are more common than basements but there are a few in older parts of the state. 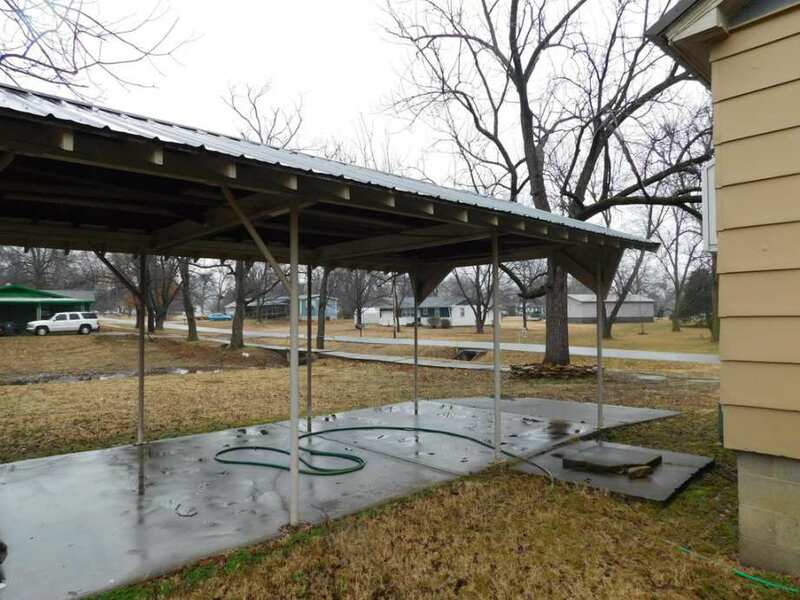 For about $2500 you can have a shelter and be perfectly safe during storms. I find the heat and humidity more bothersome actually. What a great little house, (less the flippy flop bits). Probably did start out as a standard Second Empire house, but I’m not entirely convinced it wasn’t always the way we see it now. 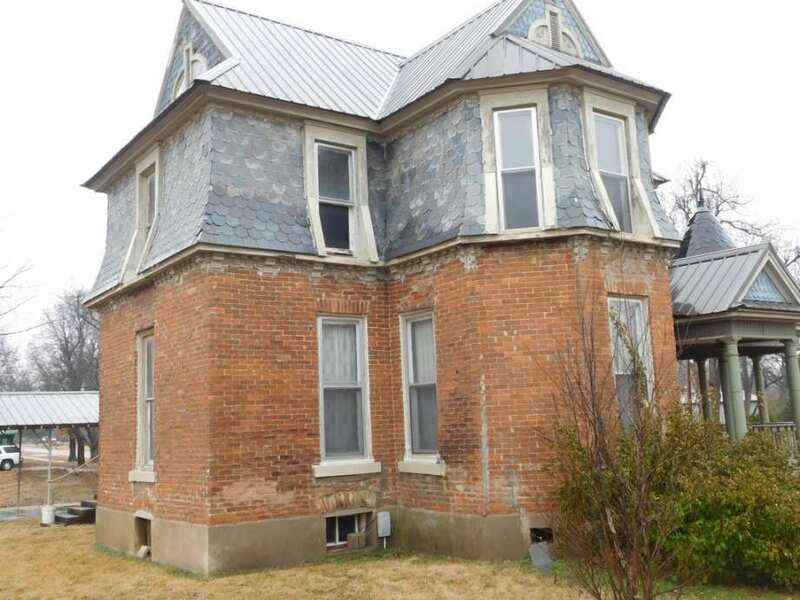 Due to the rather quirky nature of the overall design, (seemingly) original interior finishes, and other indicators; the hipped and gabled roof on top of the Mansard doesn’t seem all that far fetched. 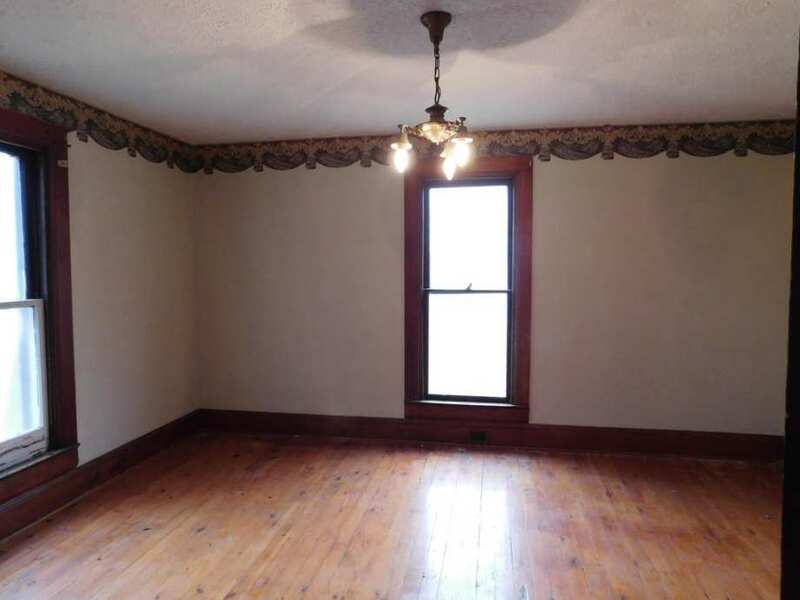 If that roof is a retro-fit it CERTAINLY works better than the one we saw awhile back; https://www.oldhousedreams.com/2017/02/20/1886-cleburne-tx/ Would be cool if someone could come up with an early image. The naïve carvings in the hall are sure fun, especially the retriever / spaniel with the duck in it’s mouth. Gettim! Jeff, I like the folk art quality of the house also, home-made from the ground up it seems. 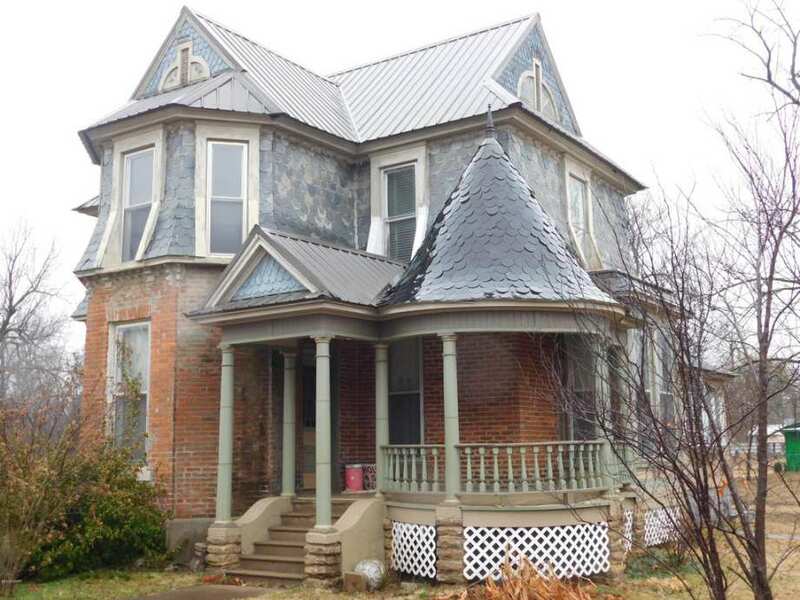 I think it’s likely this house was built pretty much as-is in the 1880’s. There was mortgage money available in town then, thanks to Mr. Cook, as I found for the post of his house. 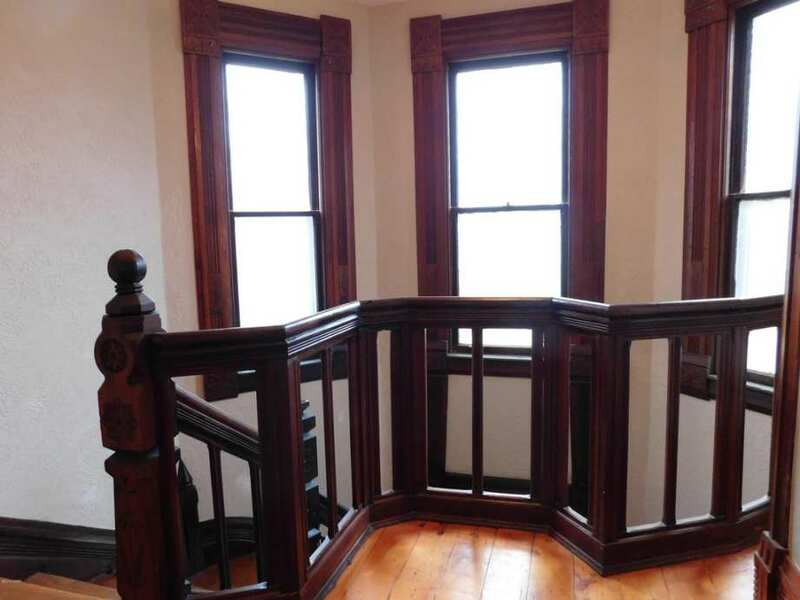 That one also had an unusual mansard roof, and there’s contemporary documentation that it was built in 1886. Right – I remember that one now. Sure hope someone was able to take those shingles away and restore the mansard. Really, that one is more of a pretty straight forward Italianate with a mansard roof, so I totally agree with your perspective on the uniqueness of homes in Chetopa. Thanks’ Jim. Nice house, I like the everything except for the kitchen and bathrooms but they can be redone. Also to like is the small yard and flat land. I think it’s a terrific house. Perfect for retirement. I LOVE the hand carvings. Looks like a nice little home. Miss John’s stories and comments, it was nice to read again. 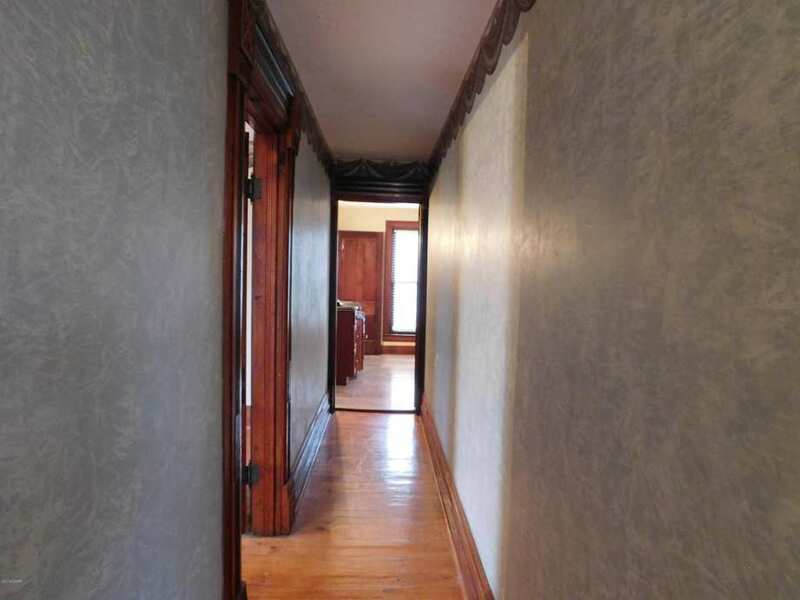 I’m restoring a home in Monson Massachusetts. The house a 1925 brick colonial revival took a direct hit from a EF3 tornato on June 1st 2011. If you google Monson Massachusetts Tornado you will see stories from people who never expected in a million years to see a tornato in Massachusetts. You will also see the older homes still standing and newer homes gone. I was born in Bethesda Maryland. I have USN embossed on my keaster. I was in Europe during the reconstruction after WW11. I have traveled and lived there speaking German before fluent with English. I was on Guam during typhoon Karen in the last century. There were also race riots in Norfolk Va., hurricane Hugo, and riots at work in Topeka Ks. (4 to be exact). During my stay in Ks. I was in a wall cloud just outside of Emporia which had 2 tornadoes concealed in it. I lived in Scranton where a tornado came down over my house. it was on its way to Topeka. I live now in a trailer, one on the side of a hill in Clearfield , a sort of suburb of Morehead KY. at the foot of Clack Mountain in the Daniel Boone Forest. I so love the sound of that. I have lived all over in this country ; NYC to Georgia to California ; Michigan and to Canada. love it and live it . Travel and help each other and love the old houses and the history they represent. This has been on OHD off/on since 2013, don’t believe it’s sold during that time. Just recently back on the market, updated with new info and photos. When I first posted this in 2013 it said it sat on .31 acres but now it says .98. 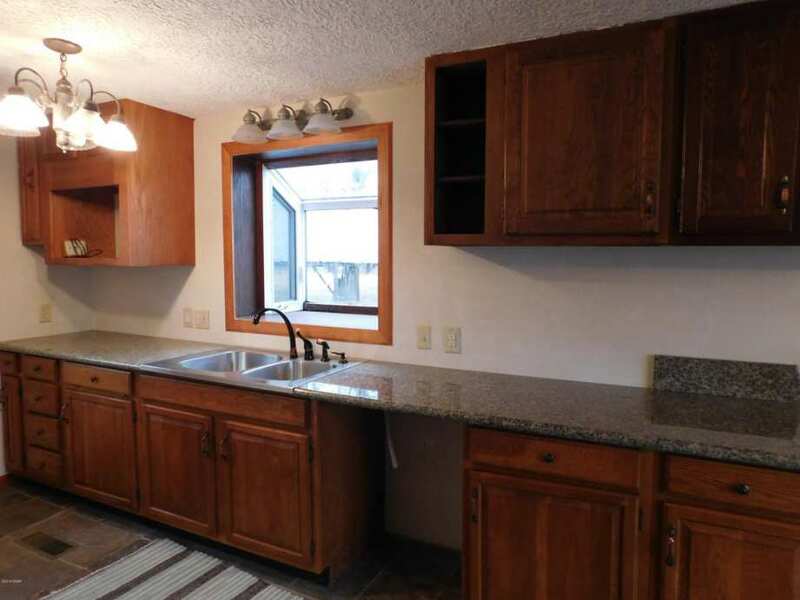 I don’t know if that’s an error or not so please check with the agent if you are interested in this home. Comments above are older, moved to the front page. Great new pix! Thanks’ Kelly. We can really admire the place from all around this time. Certainly built as is. Too bad no dog carving pic this time: but is that a scottie I see there at the first bend in the stair? Cool! I wish they had modernized the kitchen and bathroom but kept with the era of the home. Other than that it is absolutely beautiful! I would love to retire in a little house like this. I also have a fear of tornadoes. Here in Colorado, we probably have some of the least catastrophic weather in the country, and for this reason, it’s hard to make a change. But it’s gotten so costly here. 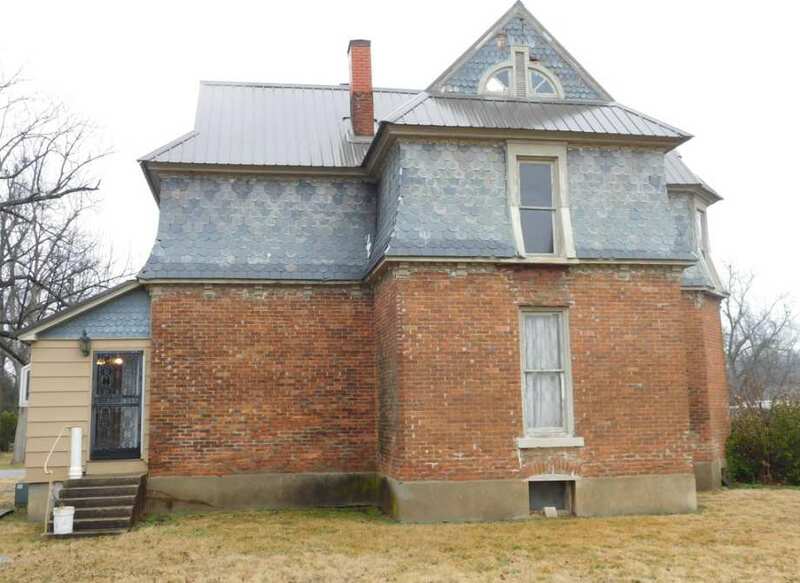 Perhaps I will take a road trip and look at this house if it’s still available in a month or so. This home is amazing to me & I’ve always loved the thought of Kansas. I was born in Witchita in 1971 but adopted & brought to Texas where I experienced West Texas tornados as a young girl, super scary but people are prepared there as well! I do plan to take my kids to Witchita this summer. Will be even my first time to see where I was born & we totally plan to explore Kansas, hopefully without tornados!! Can’t wait to see it, the land, the historic homes & it’s history! This house is adorable! I’m not impressed with the modern updates, but they could be changed one room at a time to fit the style of the house. Ditch the popcorn ceilings and wallpaper, then hunt for period lights. Could be sweet. The size of the house is pretty close to perfect. I’d also like to chime in on the tornados, you get a warning, yeah it can be scary while your in the thick of it, but it’s hard not to know in advance, even without the sirens. Something always feels wrong, or looks wrong. I wouldn’t let that deter me from a great house in a quiet little town. I love this house so much!!! 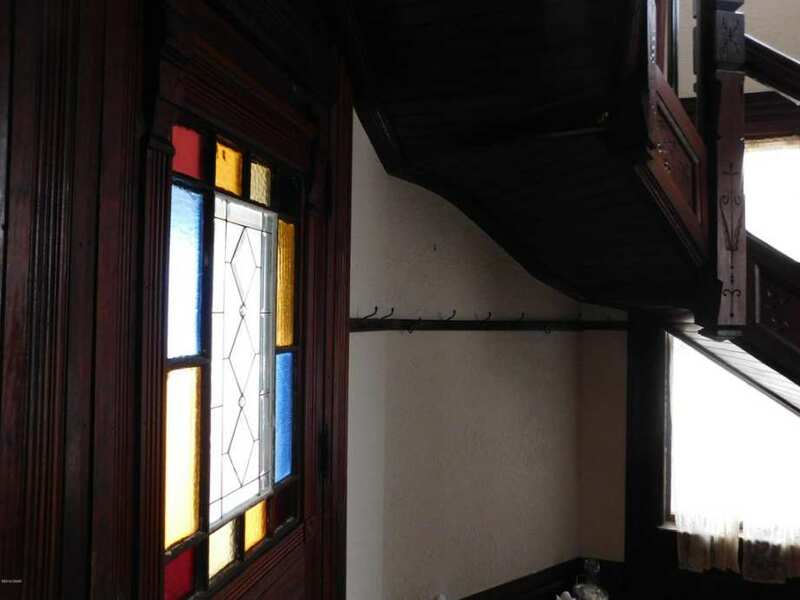 The beautiful exterior, woodwork, stained glass, it is dripping with elegant charm! After skimming the comments, I don’t see that anyone else has asked: Why is the roofing on the tower so oddly shiny? Even if wet from rain, I don’t know of any roofing materials that look like that, like it’s plastic or something. Anyone? My first thought. 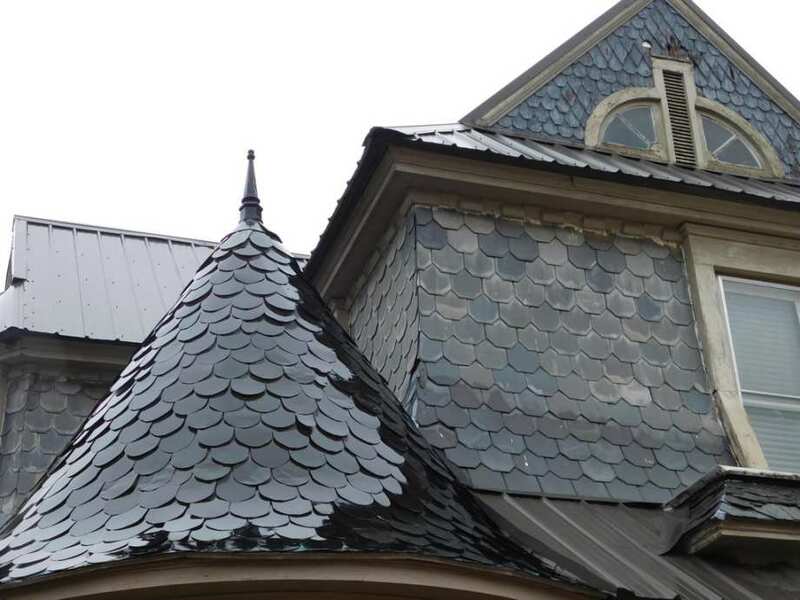 Maybe since they couldn’t fit the metal roofing to the shape, they covered it in poly? The woman whose husband did the roofing commented here but didn’t mention the turret. The comment about the roof said her husband put the “metal roof” on it. The steel roofs are shiny. I suspect they would be steel shingles designed for rounded surfaces. I think, if these pictures were taken recently, there have been a series of ice storms through the midwest the past couple of weeks. I think the tower roof has a nice coating of ice! If you look at the third picture you’ll notice that it has been raining. The shingling on the wall it dry up near the roof but the lower part is wet. The roof of the little tower is fully exposed to the rain. I live in Kansas and love it. There are tradeoffs in any area but considering high taxes in other parts of the country and the not so extreme weather, it’s hard to beat Kansas. I love this house. The woodwork is amazing. This will make an excellent retirement home. Up earlier in the comments someone said that her husband put the “metal roof” on the house for the owner. I suspect that the shiny bit is steel shingles designed for rounded roof surfaces. Looks like some kind of vinyl to me. While the new roofing has surely been a blessing in keeping the house protected, it would be the first thing to go if I ever got my hands on it – ! We are by now having ever wider extremes of weather here in the “Four Corners” area (I am in southwest Misery – er, Missouri), but considering what some of the rest of the US – and the world – are continuing to get, a place like this one in Chetopa could make a good home for the right person(s) – *if* they would be able to comfortably afford what I expect would be high costs to heat and cool the living space. The Flint Hills (and the Ozark Mountains) are interesting to explore, especially from the air.